Democratic presidential candidate Hillary Clinton says the hubbub over whether she had secret emails on her server is “very much like Benghazi,” a politically motivated scandal that’s likely not as serious as Republicans suggest. Clinton told ABC’s “This Week” that “it’s pretty clear” that Republicans are “grasping at straws” in their response to the latest release of emails from Clinton’s private home server. The State Department announced it’s withholding some of those emails because the information they contain is too highly classified. The former secretary of state says she’s been told some of that email correspondence included a public newspaper article. Clinton insists she never sent or received information on her personal email account that was classified at the time. She repeated her call for the emails’ release. 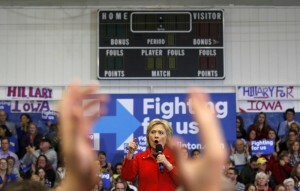 As secretary of state, Clinton presided over a key piece of the government’s response to the deadly 2012 assaults on a diplomatic compound and CIA quarters in Benghazi, Libya. The attacks killed four Americans, including the U.S. ambassador to Libya, and quickly became a political rallying cry for Republicans. Trump tells on ABC’s “This Week” that members of the Senate will choose him over their own colleague, Sen. Ted Cruz, who is also Trump’s top rival in Iowa. Trump did not offer any senators’ names. Trump says Cruz is “a nasty guy” and a “liar,” particularly about whether Trump essentially supports President Barack Obama’s signature national health care program. Trump says he would replace that law and make other deals that would accomplish his public policy goals. Cruz says the nation doesn’t need a deal-maker, it needs a “fighter” for conservative causes. Bernie Sanders says he’s ready to turn the political world upside down in Iowa. The Vermont senator is in a tight race with former Secretary of State Hillary Clinton. Sanders tells CNN’s “State of the Union” that his campaign has gotten lots of people involved in politics who hadn’t been before. He mentions the working class as well as young people who no longer “want to sit back” but want to help direct their country’s future. Donald Trump isn’t shy about boasting, but the Republican presidential front-runner says he also has a humble side.